National Savings Scheme NSS is a Post Office Savings Scheme which also saves income tax. Subsequently, all the investment upto Rs. 1.5 lakh are applicable for tax deduction under section 80C of IT Act. National Saving Certificate Interest Rate 2018 is fixed at 7.6% (from 1 jan 2018) compounded p.a and to check it using National Saving Certificate Calculator. Moreover, people can firstly check nsc interest rate chart and fill nsc online application form to apply for this central government scheme. NSC Interest Rate Chart shows that the nsc interest rate is at par with other schemes like Public Provident Fund (PPF), Kisan Vikas Patra (KVP), Sukanya Samriddhi Yojana (girls), Post Office Savings Account, Recurring Deposit – RD Account, Senior Citizen Saving Scheme (SCSS), Time Deposit (TD) Account, Monthly Income Scheme (MIS) – check nsc vs ppf vs kvp vs ssy vs scss vs mis vs rd vs td vs post office savings account. NSC account maturity period is only 5 years. National savings scheme rate of interest is low and is taxable only at the time of maturity. People can use national saving certificate as collaterals and can take loans from banks. NRI, HUF and Trusts are not eligible to invest and purchase National Saving Certificate (NSC). People can Compare All Post Office Schemes 2018 before making investment. Single Holder Type Certificate – Any individual can purchase National Saving Certificate for himself or on the behalf of a minor. Joint A Type Certificate – This type of NSC is issued to 2 adults jointly which is payable to both the nsc account holders. Joint B Type Certificate – This nss certificate type is issued jointly to 2 adults which is payable to either of the nsc account holders. People can redeem National Saving Certificates (NSC) only after the nsc maturity period on submission of certificate at post office. Moreover on receipt of maturity amount, account holder has to sign on the back of nss certificate and surrender the certificate to Post Master. NSC Interest Rate is 7.6% compounded annually. National Savings Certificate interest amount is taxable. NSC Account Holder does not receive interest earned but it gets re-invested and compounded annually. Moreover as per the National Saving Certificate Calculator, the amount of Rs. 100 will become Rs. 144.23. As NSC is a specific instrument under section 80C of IT Act, so taxpayer can claim this interest amount for tax deduction. For this reason, taxpayers will first have to show this interest amount as income and then apply for tax deduction. However, subscribers can claim maximum tax deduction upto Rs. 1.5 lakh. People can save income tax on income upto Rs. 1.5 lakh. NSC provides guaranteed Interest Rate of 7.6% per annum and can be checked using National Saving Certificate Calculator. National Saving Certificate Maturity Period is only 5 years. This savings scheme is easily available at all Post Offices. Furthermore, Interest is compounded annually and is reinvested by default. Along with the rebate of income tax, interest earned is also added to the original investment and is also eligible for tax break. For eg. if anyone purchases NSC Certificate worth Rs. 1000, then individual will get tax break on initial investment in 1st year. Moreover, people will also get tax rebate on additional NSC purchases and on interest earned. Any Individual who is looking for safe investment option, guaranteed interest and capital protection can invest in NSC. This investment option is easily available accessible than other tax saving methods. However, NSC is unable to beat inflation beating results as other investments like Tax Saving Mutual Funds and National Pension System. Any person who wants to open National Saving Certificate Account can do it through minimum investment of only Rs. 100. Moreover, there is no maximum limit and can purchase any number of denominations of Rs. 100, Rs. 500, Rs. 1000, Rs. 5000 and Rs. 10,000. Afterwards, candidates will receive interest amount which can be checked using National Saving Certificate Calculator. Buyer must submit Form A to purchase NSC account. For this, buyers can submit payment through Cash, Cheque, Pay Order, Demand Draft drawn in favor of Postmaster. Moreover, candidates can make payment from withdrawal funds of Post Office Savings Bank Account. Accordingly, Postmaster will issue a new NSC Certificate on the spot or provide a provisional slip for purchase of certificate. 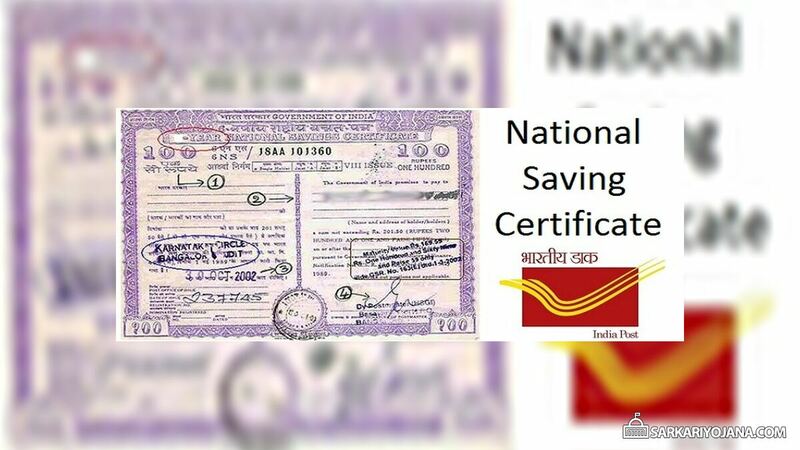 These national savings scheme nss certificate can also get transferred from 1 post office to another. NSC has 2 types of issues – NSC VIII Issue and NSC IX Issue. Central govt. has discontinued NSC IX Issue in December 2015. Accordingly, only NSC VIII is open for subscription and comes with a lock in period of 5 years. There is no TDS on the interest earned so subscriber has to pay applicable tax on the total maturity value. Loan on NSC Issue – People can also take loans from the banks against their investment in National Savings Scheme NSS. For this reason, subscriber has to transfer their certificate in the name of bank from which he / she is seeking loan. However, people cannot cannot make nsc withdrawal prematurely. Encash the National Savings Scheme NSS Certificate. Sub-division of NSC Certificate in suitable denominations in favor of individual nominees. For this, nominee must intimate the Postmaster about the death of original account holder by submitting Death Certificate. If NSC Account holder or joint account holders dies. A pledge of Gazetted Government Officer to forfeit account in accordance with the rules. On the orders of court of law. If National Savings Scheme NSS account is encashed within 1 year, then no interest is provided. In case the withdrawal is after 1 year then candidates will get interest but with discount. 7.6% compounded p.a (effective from 1 January 2018) but payable at maturity as per National Saving Certificate Calculator. Moreover, Rs. 100 becomes 144.23 after 5 years. Subsequently, deposits qualify for tax rebate under 80Cof IT Act. NSC Interest Amount after 1 year gets re-invested and is liable for tax deduction at maturity as per IT Slab.